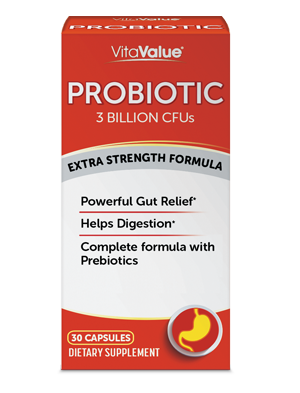 VitaValue® Probiotic contains scientifically formulated probiotics that provide powerful gut relief. * Probiotics are the healthy, friendly bacteria that naturally reside in your intestines. * They play a vital role in maintaining and restoring a healthy gut balance and digestion. * With the majority of your immune system residing in your gut, improve it with VitaValue® Probiotic daily.